As I mentioned a few days ago, I thought that the conditions were right this year that we could see some sort of tropical development across the western Caribbean between June 1st and June 10th. As of this morning, I continue to believe this and in fact some of the long range model guidance such as the GFS model has been strongly hinting at this possibility over the last couple of days or so. The latest GFS model guidance from this morning hints at a low pressure system developing over the southwestern Caribbean on June 1st and for this system to slowly creep northwestward and be located just west of Jamaica by about June 5th. Additionally, the GFS model guidance indicates that environmental conditions may become favorable in the southwestern and western Caribbean during the June 1st to 5th time frame to support tropical development. Also, it still looks like that a weak upward motion pulse of the Madden Julian Oscillation will be moving into the Caribbean during the beginning of June which would help to support thunderstorm growth and lead to the potential for tropical development somewhere in the southwestern or western Caribbean. Another product that supports the idea of possible tropical development in the western or southwestern Caribbean is the fact that the GFS operational and GFS ensemble guidance are very consistent with the development of a large upper level high pressure system over the central United States during the first week of June and lowering barometric pressures over parts of the western Caribbean. This pattern of a large high pressure system to the north and resulting lowering pressures to the south over the Caribbean is a classic signature that often times leads to tropical development across the western Caribbean. So, given all of the factors that I have laid out here, I believe that there is the potential for the development of a tropical depression or a tropical storm in the western or southwestern Caribbean (generally west of 75 West Longitude and south of 20 North Latitude) between June 1st and June 10th. Does that mean that this is guaranteed to happen? Absolutely not, however, there are more than enough signs in the data for me to point this possibility out and give you advanced notice of this possibility. It is something that I will be monitoring closely in the coming days and I will update you on the latest as conditions warrant. I am still watching for the potential of tropical development which may occur somewhere in the western Caribbean between June 1st and June 4th. Looking at the latest current data and forecast guidance, it appears that the weather feature that could be the spark for this possible tropical development is a tropical wave that is now approaching the Windward Islands. This particular tropical wave is located very near 58 West Longitude and is producing some shower and thunderstorm activity across the Windward Islands this morning. This tropical wave is forecast to track right across the Windward Islands as the day progresses today and then into the central Caribbean by Monday and Tuesday and the western Caribbean by the end of this week. The latest GFS model guidance and to some extent now the European and the Canadian model guidance is not only forecasting that environmental conditions may become favorable for tropical development across parts of the southwestern Caribbean and western Caribbean by June 1st, but also continues to forecast that some sort of tropical cyclone may form in the western Caribbean between June 1st and June 4th. The GFS model, in particular, has been very consistent in forecasting that some sort of tropical cyclone may form in the western Caribbean during the first week of June. 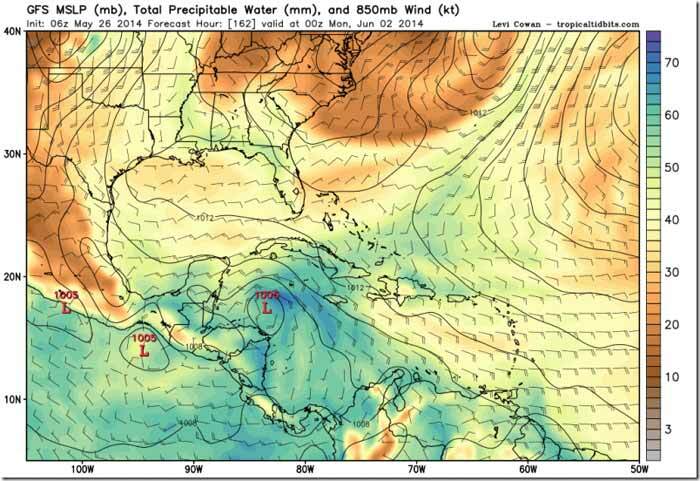 What is different now is that both the European and Canadian model guidance is also now hinting that a low pressure system may form very near the coast of Belize on either June 2nd or June 3rd. The most recent GFS model guidance from this morning is forecasting increased storminess across the western Caribbean as early as the weekend of May 31st and June 1st. This increased storminess is then forecast to morph into at least a low pressure system and very possibly a tropical depression around June 2nd near the coast of Honduras that gradually moves northward into the northwestern Caribbean around June 4th and finally near the Florida Keys and southwest Florida by June 5th. Here are my latest thoughts: I continue to believe that there is a distinct possibility that we may see the development of some sort of tropical system in the western Caribbean between June 1st and June 4th. This belief is not only supported by the model forecasts of the GFS, Canadian and European models, but is also supported by the fact that we may have a favorable weather pattern during the first week of June that consists of a high pressure system over the central and eastern United States and lowering barometric pressures over parts of the western Caribbean. This pattern of a large high pressure system to the north and resulting lowering pressures to the south over the Caribbean is a classic signature that often times leads to tropical development across the western Caribbean. Now that the GFS model guidance has some support from the European and Canadian model guidance for tropical development potential is something that will need to be watched for closely. Given this, I still think that there is a distinct possibility that we will see a tropical depression or a tropical storm form in the western Caribbean (west of 75 West Longitude and south of 20 North Latitude) between June 1st and June 4th. Does that mean that this is guaranteed to happen? Absolutely not as there is the possibility that the model guidance may be over forecasting this potential and thus creating “phantom storms”. With that said, there are more than enough signs in the data for me to continue to monitor this possibility and give you advanced notice of the potential for tropical development in the western Caribbean during the first week of June. Those of you in Cuba, Belize, the Cayman Islands, Jamaica, Honduras, and Nicaragua should not only keep close tabs on this possibility, but also be ready for the potential for several days of heavy rainfall and possible flooding starting around May 31st and June 1st. The next tropical weather discussion will be issued by 8 am EDT/7 am CDT Tuesday morning. 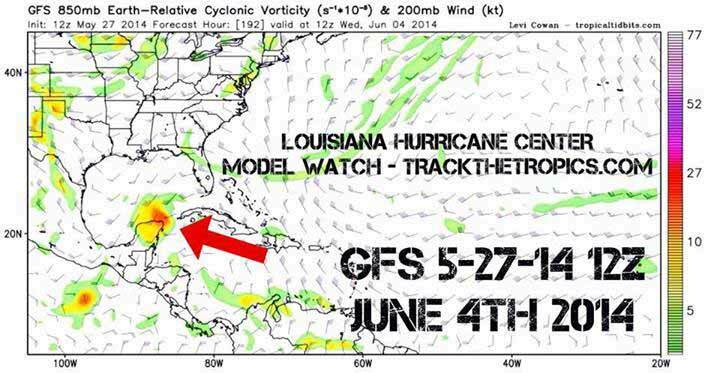 Just a really quick update – The latest GFS model guidance continues to show the potential for tropical development in the western Caribbean right around the June 1st to June 4th time frame with this system headed towards the Florida Peninsula during the June 5th to June 8th time period. The Canadian model guidance agrees with the GFS model, however, the European model guidance now shows no such tropical system. This potential system is still about a week away and there is still a lot of room for changes in both the possible development and any track this system may take. Bottom line is that I think there is a fairly good chance that we will be watching the western Caribbean starting around next Monday for development. Those of you in Cuba, Belize, the Cayman Islands, Jamaica, Honduras and Nicaragua should not only keep close tabs on this potential development, but also be ready for the potential for several days of heavy rainfall and possible flooding starting around May 31st or June 1st. The Tropical Atlantic, Caribbean and the Gulf of Mexico is quiet this morning with a lack of deep convection anywhere in the tropics. The latest model guidance, including the GFS, Canadian and the FIM models continue to show a tropical cyclone forming in the western Caribbean around June 2nd and for this system to track northward into the eastern Gulf of Mexico by late next week (around June 6th). Since the Gulf of Mexico and the Caribbean are quiet right now with no deep convection visible, where will this moisture and energy come from? The energy and moisture for this possible tropical development will come from an upper level low pressure system that is currently located over the southern Plains states. This upper level low pressure system is expected to dive southeastward into the area of the Yucatan Peninsula and the western Caribbean by late this coming weekend and early next week. This upper level low pressure system will increase storminess and heavy rainfall potential across the western Caribbean and the eastern Gulf of Mexico during the first week of June, including the Florida Peninsula, Cuba, the Yucatan Peninsula, the Cayman Islands, Belize, Honduras and Nicaragua. In addition to the stormy weather that is expected, this sort of pattern supports the potential for a tropical depression or a tropical storm to form in the western Caribbean during the first week of June. Looking at the latest model guidance, the GFS model guidance, which has been extremely consistent with this potential tropical development, forecasts that this tropical system may form near the coast of Belize on June 2nd and that this tropical system will track northward into the eastern Gulf of Mexico by June 5th. Ultimately, the latest GFS model guidance forecasts that this tropical depression or low end tropical storm will come ashore along the Alabama or Mississippi coastline on June 7th. The GFS ensemble guidance agrees with the operational GFS model in showing that the western Caribbean near Belize and the eastern coast of the Yucatan Peninsula will be the place to watch for tropical development around June 2nd or June 3rd. While the latest Canadian model guidance agrees with the GFS model in showing tropical development, the Canadian model shows that this development would occur over the Bay of Campeche around June 1st or 2nd and for this system to track northwestward towards the central Texas coast by June 4th. The FIM model guidance forecasts that a tropical system may form very near the coast of Belize (similar to the GFS model) around June 2nd or 3rd. The FIM model forecasts that this system will track northward from the western Caribbean into the southernmost Gulf of Mexico by June 5th and for this system to ultimately make landfall along the Florida Panhandle on June 6th as a 40 to 50 mph tropical storm. The European model guidance is on the complete opposite end of the spectrum and suggests that no such tropical system will form next week in the western Caribbean, but instead keeps the bulk of the moisture over the southwestern Caribbean and Central America as a upper level high pressure system builds into the western Gulf of Mexico. 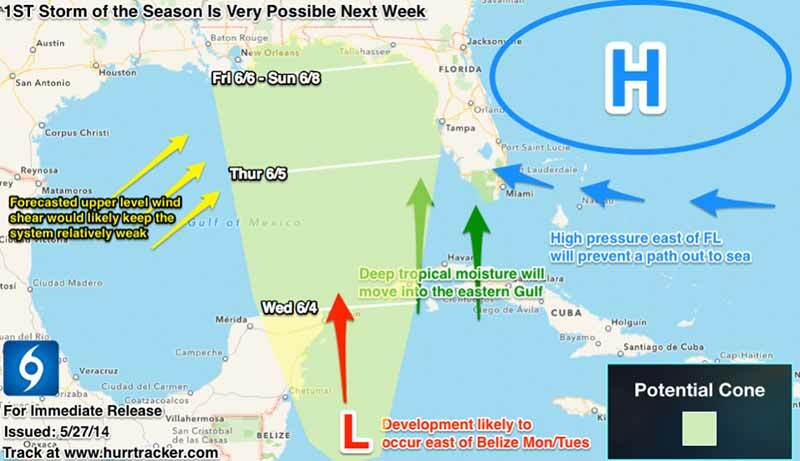 Here are my latest thoughts: The pattern that I outlined above for next week which will consist of a upper level low pressure system which will move into an area around the Yucatan Peninsula will set up a pattern that will promote heavy rainfall from the western Caribbean northeastward into the eastern Gulf of Mexico. Additionally, the western Caribbean will be on the eastern side of this upper level low pressure where we will find rising and divergent air which supports not only the idea of stormy weather, but also the idea of possible tropical development across the western Caribbean. Based on this, I continue to believe that there is a distinct possibility that we may see the development of some sort of tropical system in the western Caribbean (west of 80 West Longitude and south of 20 North Latitude) as early as June 2nd or June 3rd. If a tropical depression or tropical storm does form in the western Caribbean next week, its most likely path will be one that is north-northeast or northeast as a high pressure system over the Atlantic will block it from turning east. This north-northeast or northeastward track would keep it close to land from the western Caribbean into the eastern Gulf of Mexico possibly threatening the Yucatan Peninsula, the Cayman Islands, western Cuba, the Florida Peninsula and the Florida Panhandle, the Mississippi and the Alabama coastlines. Does that mean that this is guaranteed to happen? Absolutely not as there is the possibility that the model guidance may be over forecasting this potential and thus creating “phantom storms”. If a depression or a storm does not form, we will definitely see a surge of moisture across the western Caribbean and the eastern Gulf of Mexico leading to a extended period of stormy weather and heavy rain for much of next week across all of the western Caribbean and the eastern Gulf of Mexico. Those of you in Cancun and Cozumel, Belize, Cuba, the Cayman Islands, Honduras and Nicaragua as well as those of you in the eastern parts of the Gulf of Mexico, including the Florida Peninsula and Florida Panhandle should not only keep close tabs on this possibility, but also be ready for the potential for several days of heavy rainfall and possible flooding starting around May 31st and June 1st and continuing through much of next week. The next tropical weather discussion will be issued by 8 am EDT/7 am CDT Thursday morning. Batten down the hatch's storms starting early? I arrive on June 5th. 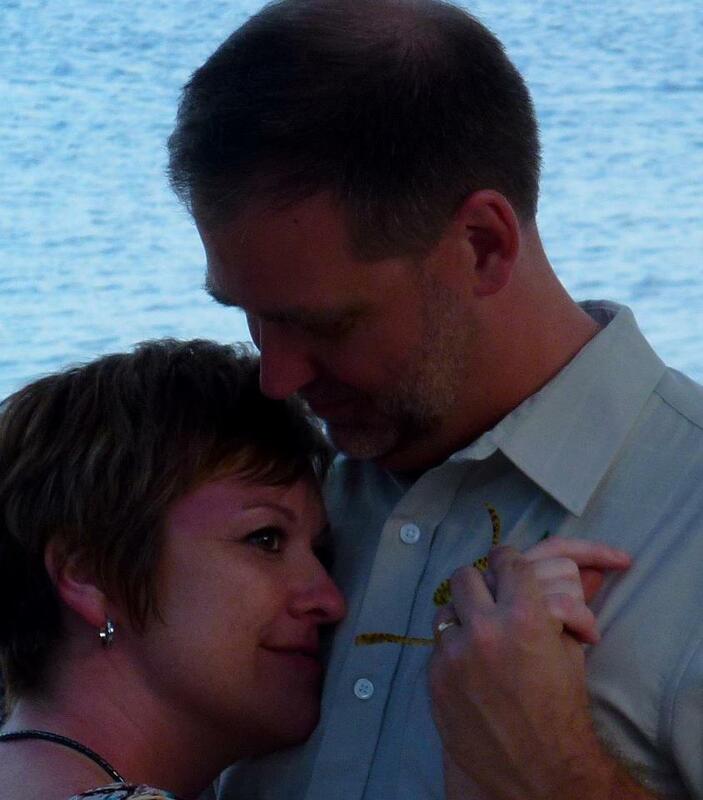 I expect my Belizean friends will honor their commitment and ensure that paradise awaits. That is all. GFS continuing today to show a possible depression/weak Tropical Storm coming out of the NW Caribbean... the model/image below is showing what could be a storm in the extreme southern Gulf June 4th. The FIM and CMC are also showing some development still. I just want to clarify if something does develop I do not see it becoming a monster storm... Tropical Storm/ rain maker at most. 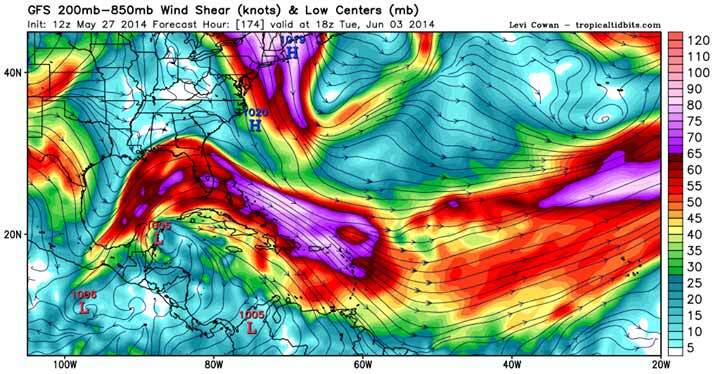 There will be a good amount of shear in place during that time which would inhibit any real intensification. BUT this far out things/conditions can change. I would also still only give a 40-50% chance of any Tropical system forming at all, could just be a low pressure system. Tropical development is still possible next week, not a guarantee though. This is a complex weather pattern setting up & hopefully details will become clear as we get closer to this weekend. 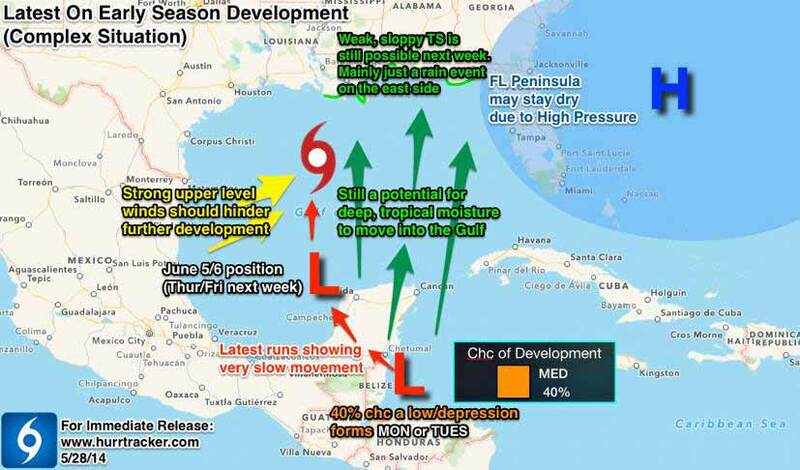 Our team believes there is about a 40% chc of development this Mon/Tues just east of the Yucatan. Latest data shows if a system develops, it would be weak and slowly meander near the Yucatan Peninsula for the first half of next week. Late next week, steering patterns would favor a track towards the north, but that is too far out to say with any certainty. Any system would be lopsided with most of the active weather (mainly a heavy rain event) setting up on the east side. We do NOT expect anything more than a depression or weak TS at this point. No immediate cause for concern at this time, just a heads up based on the latest info.